Travelling for business can be an exciting experience, but it can also involve juggling a busy schedule packed into a few days. With so much to organise and remember, it pays to have a few tricks up your sleeve to make your trip a little less complicated. If you’ve got a business trip planned soon, let us help lighten the load with some simple suggestions for making it a little bit more seamless. Remember, a corporate specialist personal travel manager can help manage your next trip, leaving you to focus on the business of business. Mid-week flights are popular with those travelling for business, meaning overhead lockers are often filled to the brim with briefcases and bags. On full flights this can mean it’s a struggle to find room for your own carry-on luggage. Next time you’re on a busy mid-week flight, consider taking a soft, smaller bag (such a rucksack or suit bag) that can slot in between bags overhead. It’s a simple strategy that can minimise stress when boarding your flight. For business travellers, this trick is particularly important for long-distance flights. Laptops, tablets, books and newspapers are all common items used by business travellers during a flight. If you are going to be working on-route to your destination, consider placing all of your reading material in a separate bag (within your carry-on luggage) before you get on the plane. 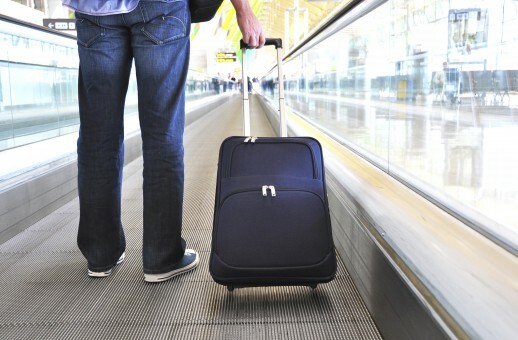 When you reach your seat, take your ‘work’ bag out of your luggage and stow the rest of your carry-on overhead. It’s easy to prepare before you leave home and saves you the pain of organising yourself once onboard. When it comes to airport security, rules can differ from country to country and can change quickly. For example, there are now flights from the United Kingdom to the United States where electronic devices (mobile phones, tablets, laptops) will not be allowed on flights if they are not charged and able to be turned on. As mobile phones are often an integral part of any business trip, make sure you charge up before your flight to avoid any unnecessary hassle. Do you have any useful tips for travelling for business? Share your comments with us below!